Jason Scheff back row 2nd from the right. Since 1985, Jason has been the bass player and vocalist for Chicago. He joined Chicago at 23, when Peter Cetera left to pursue a solo career. His ability to closely replicate Cetera’s vocals allowed the band to carry on without hitting any bumps. He is also the son of bassist Jerry Scheff who is known for playing with Elvis Presley on tour. See what he had to say to us here at Rock Show Critique. RSC: What are the current plans for Chicago? Do you have any other projects or solo things coming in the near future? 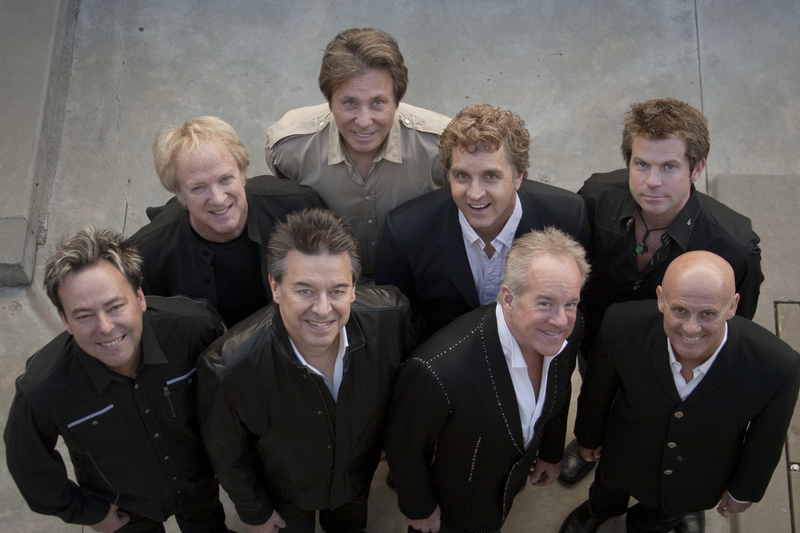 Jason Scheff: First of all Chicago has a great summer tour booked with the Doobie Brothers. We’ve toured with them twice before and it’s always great to get with old friends again. And these packages you put together really give the fans more bang for their buck. It’s great to integrate with these guys. So we are going to head out and do that this summer. We’ve also started putting a lot of our songwriting efforts together. And who knows maybe there’s some new recorded music in the works. Which I’m very excited about. We’ve all been individually writing music and a couple of us have been collaborating here and there together. There’s been a recent spirit of putting it all together to see what we have. So I hope that there’s new Chicago music available in the very near future. As far as side things and solo projects, I’ve been working on a solo record myself with Jay DeMarcus of Rascal Flatts who produced Chicago 30. He’s always been a great champion of my cause. He’s really been spearheading this movement to do a little project of my own. Other than that I’m involved with the company Beachbody makers of P90X. I’m currently in the round of P90X2 to get ready to go out and do their summer tour with the Doobie Brothers. I love sharing that experience with people, my site jasonscheff.com has become this great movement of a lot of folks taking control of their health. So that’s pretty much what I’m doing along with the band. RSC: What was it like landing the part in Chicago? Did you feel added pressure knowing you had some big shoes to fill? JS: Sure I was twenty three years old at the time, so luckily I was young and stupid enough to not think about it too much (laughs). When you’re at that part in your life you think you can do anything. The good news is they came pursuing me and so I knew at least there was interest there. I have to hand it to the guys in the band as well as the guy who was managing the group at the time, Howard Kaufman who really encouraged me. They wanted it to work out with me and was basically telling me, go in and get the job. It’s yours just go get it, which translated to me it’s your game to lose, your in the lead so why don’t you just go and pull this off. You’re in. It was a great moment of breaking through some courageous barriers. We cut the record Chicago 18 it went real smoothly, I was comfortable in the studio. Then we got out on the road I was a little nervous because they were coming off their biggest selling record to date Chicago 17. I was this twenty-four year old kid going out there following “You’re The Inspiration”, “Hard Habit To Break” and singing these songs. I didn’t know if they were gonna throw tomatoes at me or anything. The fans were very welcoming and had these signs up saying Welcome Jason. What it told me was that people wanted this music to continue. Of course Peter Cetera is unbelievable and I adore his work, I’m friends with Peter, and I know he’s told me that he likes what I do and he’s thankful we kept the thing going. It’s just been a great ride, it continues. RSC: Do you have a favorite song you love to perform in particular? JS: I always go back to “Just You ‘N’ Me” because that’s the first song I discovered the band on Chicago VI. I was just starting to really get into being a heavy radio listener. So that or “Feelin’ Stronger Every Day”. But “Just You ‘N’ Me” the musicality of it, the horn solo in it. Such a musical adventure, that every time we play it takes me back to that time I discovered the group. RSC: With so many people in the band how do you guys decide which songs to play? Do the set lists for the shows alter much? JS: No we don’t, we really come up with a set at the beginning of the year. And it may get tweaked a little bit here and there. I’m not really one of the guys that gets involved with that too much. We end up coming up with a set that seems like it covers the entire span of the groups career with the peaks and valleys of what a great show and experience will be. Once we lock into it we pretty much stick with it, because it works. We try to revisit it each year, change a little bit so its not the same show that people been coming to over time. We pretty much zone in and lock in on it. RSC: Do you have a favorite in concert moment that stands out? JS: Well going back to that first day when I walked out on the stage and saw the signs welcoming me into the band that’s a pretty profound moment for me. Also, i’d have to say it’s weird, calling it a favorite usually comes with a happy experience. But this one was kind of somber but it was powerful. We played September 12, 2001 in Puyallup, Washington at the Washington State Fair. Obviously the day after 9/11. We decided to stay out on the road rather than fold up and go home. It was weird, travel was strange, everyone was on alert. We were doing “Feelin’ Stronger Every Day”. And it was the first time that I ever really felt that I was so connected to that song that it really became a part of me as well. Yeah I’ve been with the group twenty six years so I feel connected to all the music cause we’ve done it for so long. In one sense I’ve always felt this is a part of their history and I’m coming in to just participate in keeping it going. But that night seeing the looks on people faces and what it was doing to them, I realized that we were literally administering medicine to them and it was incredible. The looks on their faces, that’s feelin’ stronger every day, the day after. The power of music and what it does when its super, super important with something like that the day after a life changing event. I really felt lucky and honored to be a part of that homage to see that we were literally injecting medicine into these people with a message like that. RSC: What can the fans expect when you guys take the stage at Seneca Niagara Casino on May 5? JS: They can expect to see a group that’s been around for forty plus years that never go out and phone it in. Every single night we go out there it’s just unbelievable. I hear from people all the time that are in bands that have been around a long time some of these people don’t care anymore. You’re going to see every single guy up on stage playing like their fifteen years old and this may be his only shot. And a camaraderie, a renewed excitement because like I said we are starting to work on some ideas that will hopefully transplant into some new music. Plus having had a nice break, we’re gonna be coming up there fresh and just rocking people up. You watch and see it’s a blast. Special Thanks to Laurie Gorman and Tony Astran for setting up the interview!